Savvy deer hunters know that calling whitetail bucks by imitating two bucks sparring, can be an exciting proposition. Who would have ever thought that clashing two antlers together would bring area bucks running? In most areas where buck/doe ratios are correct, rattling is a deadly tactic that is overlooked by many hunters. Rattling is actually a simple process where hunters bang a couple of deer antlers together – or use a rattling bag – to mimic two bucks fighting. When used in conjunction with a grunt call this tactic has duped many wary bucks. With the advent of lifelike deer decoys like Carry-Lite’s EZ Buck HD, rattling can be taken to the next level. Simply set out your decoy, or decoys, to authenticate your rattling sequence and get ready. Remember when using decoys to exercise caution. One of the biggest problems hunters have faced in the past when rattling is the cumbersome transport of deer antlers. They seem to snag on everything. Deer antlers also present a safety concern in areas with higher densities of hunters. 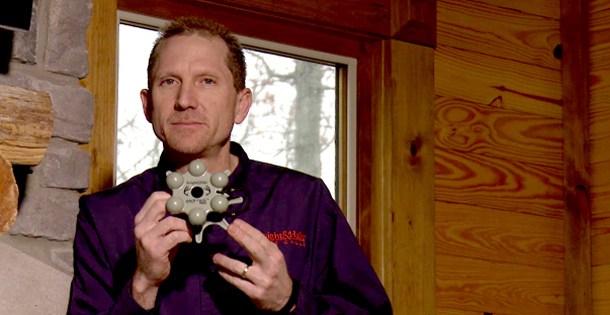 So how can you rattle effectively, stay safe in the process, and still effectively attract whitetail bucks? Knight & Hale Game Calls has the solution with their Pack Rack Magnum. This compact, innovative call features cutting-edge acoustical properties that make it sound identical to “real” antlers. Its ergonomic design provides for ease of use, without the hindrance of snagging the rattling horns on tree limbs and brush. Best of all the “Magnum” design produces more volume to reach out to bucks on windy days. The Pack Rack Magnum snaps together and can easily be transported in a fanny pack or backpack. Deer experts suggest when rattling from the ground, to set up in an area where you have a good view of any approaching bucks as they tend to sneak in on you. The Pack Rack is perfect to use from a tree stand, too. So remember: The next time a buck hangs up out of your range, just tickle the Pack Rack together and grab your weapon. For the big deer sound in a compact package, you can rely on the Pack Rack Magnum.